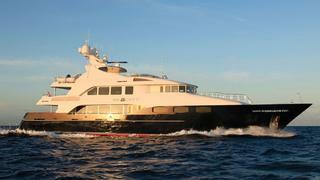 Chris Daves at Denison & Daves tells me that the owner of the 42.7m motor yacht Big City is now ready to sell, and has put her back on the market. Launched by Trinity Yachts in 2009, she is the latest iteration of the company's 141ft series of all-aluminium, semi displacement motor yachts, and was built to the exacting standards of her experienced owners. She is fully equipped with the latest technology including a Kaleidescape entertainment system and Quantum ZeroSpeed stabilisers. She can accommodate 10 guests in 5 staterooms, including a main deck master suite. Her Patrick Knowles interior balances traditional styling with contemporary. An unusual feature to make even the hottest day comfortable are the mister sprays on the arch and surrounding the tub to cool guests. Big City is asking $21.9 million.